As much as I like big nuts (now, now), I’ve always harboured ambitions to visit The World’s Biggest Moose statue in Canada. And just when I think I might go, it appears that Norway has upset the apple cart of the Great White North. 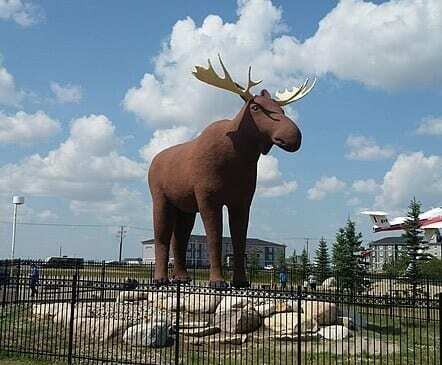 The aptly named Canadian town of Moose Jaw has, for the past 31 years, laid claim to the coveted title with their, quite frankly amazing, statue called Mac the Moose. Mac, a very proud Canadian moose from Saskatchewan in Western Canada, is constructed from steel and concrete. He stands at a massive 32 feet tall and weighs 10 tons. He’s also really cute in a moose-y type way. However, just when Moose Jaw thought it could rest on its gigantic antlers, along comes the town of Stor-Elvdal in Norway. Not content with the Atnbrufossen Vannbruksmuseum (waterworks museum) which hosts exhibitions and concerts in the middle of a gorgeous landscape, the town of Stor-Elvdal commissioned a moose statue of their own. Knowing all too well about the original Mac, the sneaky Norwegians deliberately ensured that their ‘Storelgen’ (giant elk) would be 30cm taller in order to steal the crown – and accompanying thunder – from Saskatchewan. So, just like that, the world has a brand new (very) Cold War on its hands, in every definition of the word. At the moment, temperatures in Moose Jaw are a brisk -9 and, well…Stor-Elvdal’s in Norway. Moose Jaw’s Mayor is determined to put things right, but the Norwegians are refusing to back down. Will Canada be able to reclaim their title by putting an RCMP hat on Mac’s head? Or will the brand new (and extremely shiny) ‘Storelgen’ moose continue to reign supreme? And should I cancel my tickets to Saskatchewan and fly to Norway instead?